A graduate of the Pardubice Conservatory and Prague´s Academy of Performing Arts (studying with prof. Jiří Válek), Roman Novotný began to make a name for himself during his studies performing highly well at Czech and international competitions. 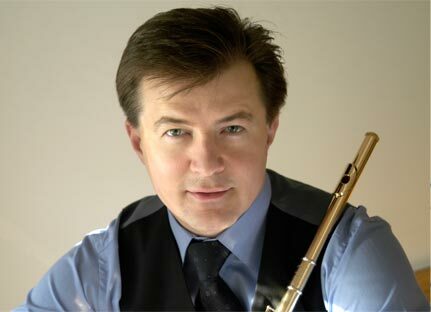 He has appeared as a soloist with a number of orchestras, including the Prague Symphony Orchestra, the Prague Radio Symphony Orchestra, the Slovak Philharmonic, the Pilsen Philharmonic and the Czech Chamber Philharmonic Pardubice, and he has been conducted by a host of considerable names (Václav Neumann, Vladimír Válek, Gerd Albrecht, Charles Olivieri-Munroe, Paolo Olmi, Leoš Svárovský, Oliver Dohnányi, Petr Altrichter, Rastislav Štúr, Marko Ivanović, Jiří Malát). He has also appeared in Germany and Hong Kong, and in Tokyo´s Suntory Hall he performed as a soloist in Mozart concertos accompanied by the Prague Chamber Orchestra. He played a world premiere of the Flute concerto “Letter to father” by Lukáš Sommer in the Prague Spring International Music Festival in 2012. In 1995 he established the Afflatus Quintet which, two years later, won 1st prize at the ARD international competition in Munich and became recognized as one of Europe´s leading chamber ensembles. They have performed in prestigious venues in their native country, in Europe, Japan and Australia; they won the Classic ´97 award for their superlative interpretation, particularly of 20th century music. In 1998 the ensemble won the main prize awarded by the Czech Chamber Music Society (ČSKH) and it received the same award in 2003 as well. In the season 2011/12 the Quintet was the ensemble-in-residence of the ČSKH. The Afflatus Quintet now has eight CDs to its name, produced for Supraphon and the Japanese Octavia Records company. The ensembles´s recordings have earned the highest ratings from the music critics. Czech Philharmonic flautist and also teacher from the 2000 at the Prague Conservatoire, Roman Novotný has worked with leading Czech artists for a number of years, in particular with harpist Jana Boušková. They perform together in concert at international festivals (Rheingau Sommer, Concentus Moraviae, Moravian Autumn) and during series organized by the Czech Philharmonic, the Brno Philharmonic and the Prague Symphony, and they also record together (two CDs and recordings for Czech Radio). In 2009 he began performing and recording with violinist Jiří Pospíchal and pianist Ivo Kahánek; among their successful recordings is a CD featuring works by Bohuslav Martinů and his French contemporaries. This programme was also chosen for concerts in the Czech Republic and Germany. Roman Novotný recorded an album with the Prague Chamber Orchestra containing music by the early Czech masters, which came out on the Radioservis label in 2011. Roman Novotný plays Japanese Muramatsu flute.